We took a step away from Paul’s travels to make a sojourn to Delphi yesterday, but first, we went to Kalambaka to an iconographer’s workshop. Every souvenir stand has copies of icons, but Betty encouraged us to wait until we got to the studio to buy any of them. I’m glad we took her advice. The bus pulled up in a rather industrial parking lot and wewalked up the wide stairs to the second floor of a warehouse building where we found the workshop. The sister of the Orthodox priest, who is the primary iconographer, showed us the woodworking room, where they cut and carve the boards; the racks where they stretch the canvas and then cover it with a mix of animal glue and mastic; and the studio, where she also showed us the stages of icon writing. The walls of that room were covered with shelves full of finished icons, so, after the presentation, many of us purchased them. This is what I have been waiting for. 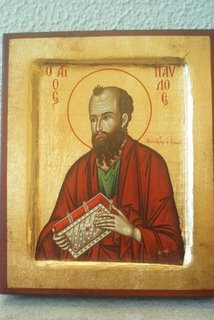 I bought an icon of St. Paul,, which seemed appropriate for this trip. Later, I realized how deeply moved I was by the experience: I didn’t take any pictures. Here is a picture of the icon I bought, taken in our hotel room. 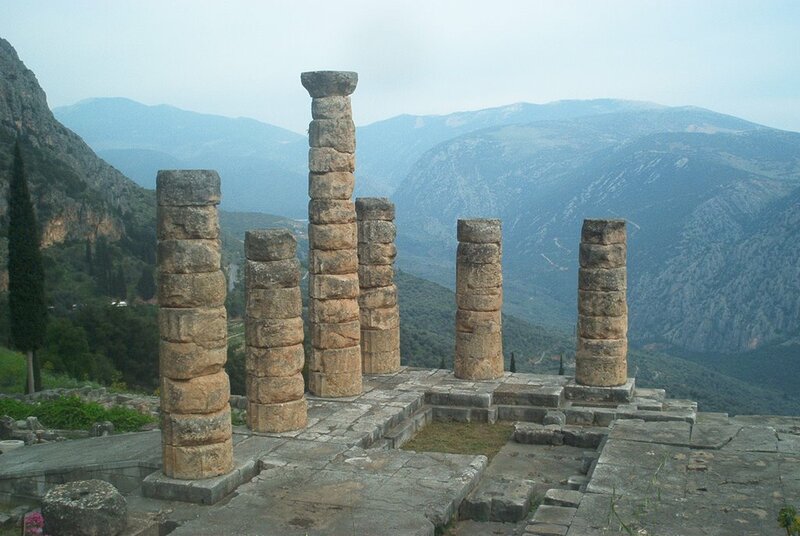 From there we began the four hour trek to Delphi, which was the home of the most famous oracle of the ancient world. 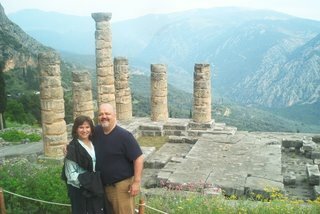 We climbed up and down mountains until we ended up in the foothills of Mount Parnassus and the ruins of Delphi. 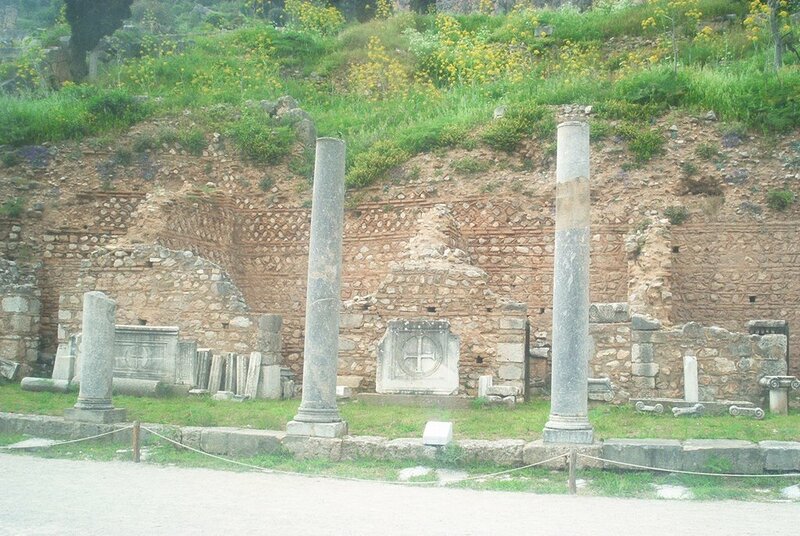 The first temple was built there, to Gaia, the Earth goddess, in the third millennium BCE. In the eleventh century BCE, the first temples for the oracle were built. What is left now are the layers of building and rebuilding. 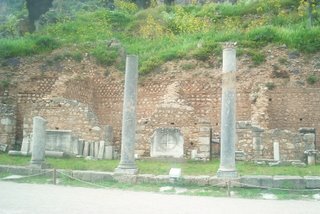 At the lowest level, where the shops for people to buy gifts f or the gods and souvenirs for the ride home would have been, we could see the Greek layer, covered by the Roman layer, covered by Byzantine marble marked with crosses. 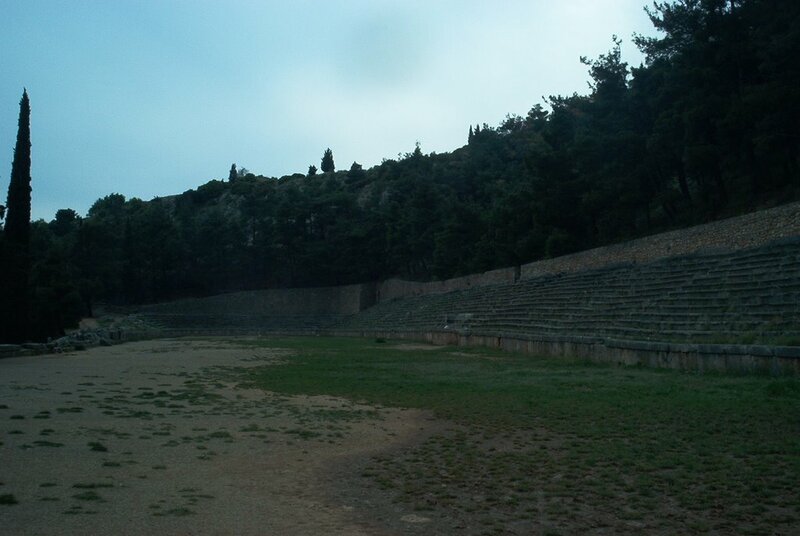 From the shops, we zigzagged up the hill to the Treasury of Athens, the Temple of Apollo (where the oracle was housed), the amphitheater (where performances were held when the oracle was not speaking), and – at the very top – the athletic venue (even the fans would have had to be in shape). Once a year, the oracle spoke. Both governments and individuals came from all over the Known World to ask questions and seek advice. 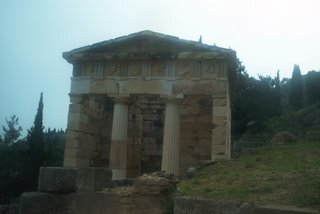 We stood at the top of the hill, looking down over the valley that was hours drive from any significant metropolis, and would have been an incredible journey for those walking and riding from the many city-states around Greece. According to Betty, the power of the oracle lay in two things: the amount of information available and the ambiguous answers given, which called people to make their own choic es. The oracle was not a carnival fortune teller, reading tea leaves or palms to say you were going to meet a dark and handsome stranger. 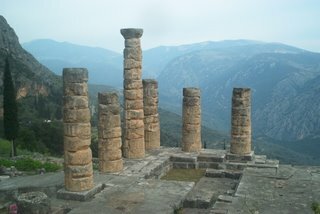 There was a network of spies, or information gatherers that covered the Greek world and fed the information back to Delphi. When the questions were asked (should we go to war? ), the answers were given (if you do, a great empire will be destroyed) and then the decision was left to the inquirer (is she talking about my empire, or my enemy’s?). The lesson we humans have had to learn down through history is our decisions have consequences; there is no magic formula. The sheer scale of both the natural landscape and the human construction was humbling. As I walked, I wondered what ruins will be found from our lives a millennium or two from now. Shopping malls. Maybe a stadium or two. I asked the question of one of our group and he replied, “We don’t have anything that will last that long.” And people will probably still be coming to Delphi. As we walked, we encou ntered people from all over the world. An Italian woman stopped Ginger to ask a question. Ginger does not speak Italian, and the woman did not speak English, but Ginger said she spoke “un poquito Espanol.” So did the Italian woman. The two of them stood among the giant columns, saying all the Spanish vocabulary words they knew, trying to connect. I ran into some American college students at lunch. When I asked where they were from, they said New York and New Jersey. When I told them I was from Boston, one of the guys said, “Oh, that part of the world.” He laughed. So did I. “At least this far away from home we can act like friends, right?” I asked him. Our group is made up of people from Arizona, Kentucky, Indiana, Ohio, Connecdticut, and Rhode Island. Ginger and I are the only two that aren’t with a larger church group; We are also the least conservative theologically, by far. And everyone has worked hard to connect, rather than debate or differentiate. This trip is a pilgrimage for all of us, even though what is sacred differs from one to another. 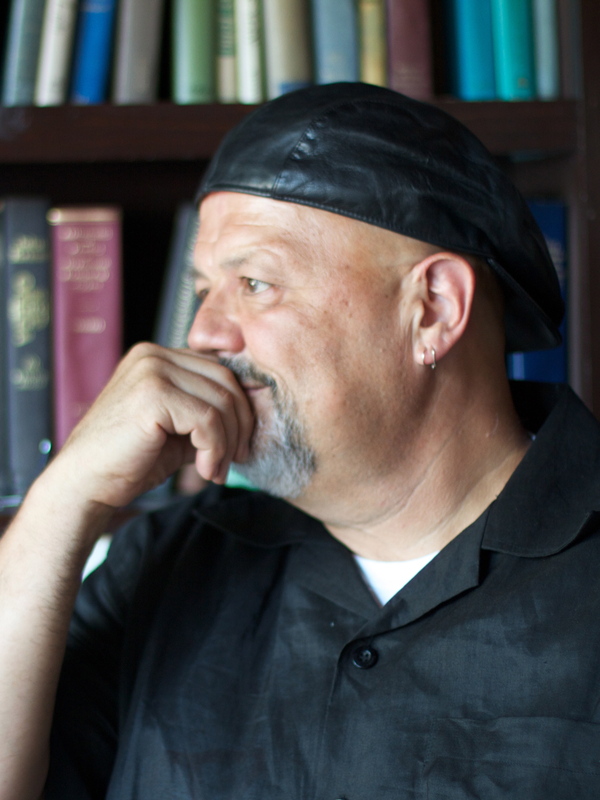 We are fellow travelers, on the road together, as Christians have done for about as long as there have been Christians. 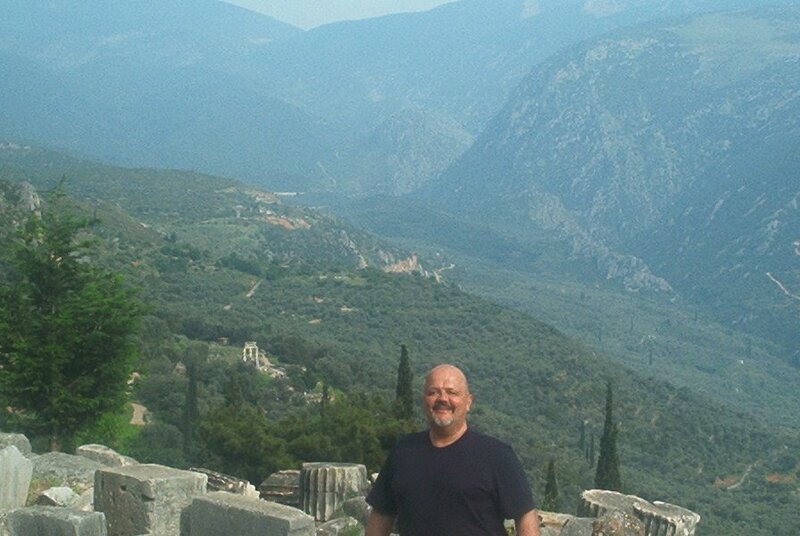 As we left Delphi and began our descent back to Athens, which was another three hours, we sang hymns together, which seemed the most appropriate response to the grandeur of nature that cradled us as we rode. For five thousand years people traveled that valley with a sense of awe and wonder, searching divine guidance. What they learned we felt as we rode and sang together: God speaks first through those with whom we share the journey.